The loud thud on my back porch window startled me. I turned to see what caused the noise and viewed a mess made by a bird that did not see the window prior to crashing into it. I do not need to go into more detail. Most people have observed something similar on their own windows. At that moment, I became engaged in another activity and did not return to the bird versus window contest until the next morning. When I did go to inspect the site, the ground was covered with nothing but features and a few bird bones. I nodded my head in agreement. These incidences make me sad. Still, long ago I learned this is part of the predator and prey nature dance. Okay, okay maybe I read too many conspiracy-based mystery novels. Maybe I was assigning attributes to the hawk that simply are too complex for him to own. But when I presented the possibility to my nature expert husband, he showed no surprise at my question. Instead he said he was guessing that was exactly what happened in both cases. Intentional strategizing for outcome probably was not available to the hawk. But by pursuing the sparrow, causing it to become confused and stray into harm’s way, the hawk achieved his goal. While thanking God for Windex, I also took a moment to thank Him because I am not a sparrow. 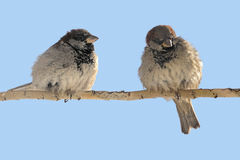 Then that night, in my meditation time, God reminded me that at times I am indeed very much like that sparrow. You see, when I take my eyes off my heavenly Father and turn to other sources for guidance, I can become confused about my direction and purpose. Or I can proceed along a course where I run blindly and may even make tough situations worse for me and others. Just as the hawk pursues the sparrow into his snare, the enemy is skilled at pursuing, causing confusion, and corralling the disoriented soul into his web of disaster. I can find myself fearfully flying into the enemy’s entrapment. The simple answer is, “I cannot do that by myself.” I must be in God’s word, seeking guidance and wisdom at all times. He has provided a wonderfully rich circle of brothers and sisters to support, uplift, and walk with me. I need to remember that even in times when the enemy is close on my heels or life is handing out problems, I am not without Him on any level. It is imperative I resist the temptation to panic and run forward without His wise counsel. There was a hymn written in 1905 by Cevilla D. Martin that assures us God’s eye is on the sparrow as well as on us. He watches out for our welfare and the needs of our bodies, hearts, and spirits. And even though I take great comfort in knowing His eye is on me (the human sparrow), it is vital to my spiritual survival that my eyes always remain on Him as well. I definitely think a hawk might be masterminding these “accidental” deaths. I once witnessed a hawk pursue a poor little dove. The dove was circling and diving, and I thought it might wear the large hawk out and escape. But no, the hawk planned ahead, cutting the dove off at his next circle, and driving it into a tall bush. Both birds went in…and I left before I had to confirm that only one bird came out.